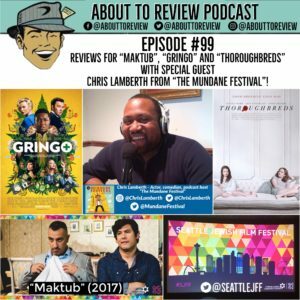 Returning guest Chris Lamberth of “The Mundane Festival” joins the show as three new movies are reviewed: “Maktub” which was part of the Seattle Jewish Film Festival, “Gringo” and “Thoroughbreds”! The countdown to episode 100 is almost here! Make sure to follow Chris’s podcast “The Mundane Festival” as he races past his 269th episode! Also, if you are in the New York area, check out his live comedy specials which he also posts about on his social media channels. Thank you so much to Chris for making the time to be on the show, and I look forward to our next collaboration!